An excellent and economical choice for most applications involving rough or irregular surfaces. Our conformable is available in black or yellow/black diagonal stripe. Foil back designed for irregular surfaces. 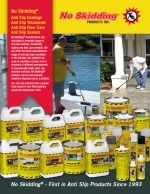 Economical and simple to apply anti slip high traction to irregular surfaces. An anti-slip material that can be rolled and bent or angled to fit any contour as the pattern illustrates. It is constructed of diamond hard mineral, coated, on adhesive backed aluminum foil. Simply peel off liner and set in place. Remove the backing liner from our Conformable Grit tape. Press down by hand making sure of even distribution. With a rubber mallet, gently hit the top surface of the material so that it conforms to the irregular surface. Conformable Anti-Slip Abrasive Tape is for use on irregular or non smooth surfaces. PRICE PER 60 FT. ROLL. 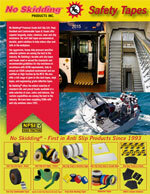 Anti Slip Tapes Catalog 2013. When applying our foil backed conformable anti slip tape onto irregular surfaces or diamond tread plate use our soft rubber mallet to ensure the tape follows the contours of the irregular surface..
Anti-slip Strip that can be conformed, bent or angled to fit any contour. Constructed of diamond hard mineral, coated on adhesive backed aluminum foil. Peel off liner and set in place. Use rubber mallet to conform material to irregular surface. 6"X24"